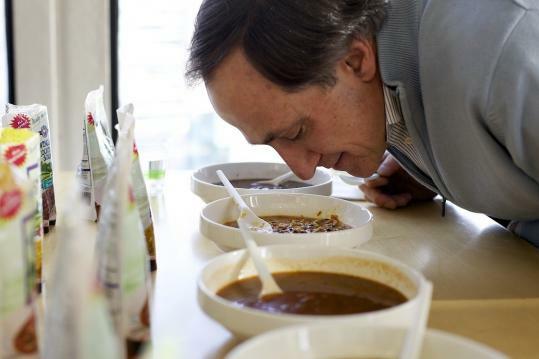 M. Peter Thomson has been in the packaged food industry for decades, first with private-label gravies, sauces, and salsas, and now with homemade-style soups. But it’s not just noodles and broth anymore. Thomson’s New England Country Soup offers all-natural, low-sodium soups in down-home flavors such as Lentil, Chicken Corn Chowder, and Yankee White Bean, packaged in ready-to-heat pouches. New England Country Soup, with offices in Cambridge and Vermont, uses family recipes and seeks ingredients from family-owned farms and producers. But it’s doubtful Nana would recognize the technology behind the soups. “You would be absolutely amazed how much science goes into the packaging, manufacturing, and even recipes,’’ said Thomson. I draw the line back to my grandmother, who is from a little village near Naples. In Italy, food is love, and I distinctly remember growing up learning how to make bread and fresh pasta. How did you know it was time to start New England Country Soups? I looked around and was none too impressed with the quality of offerings. They were so tasteless, high in sodium, and low in fiber. I believe we can make a better product. We even include an “Ingredient Tracker’’ code on every package, where consumers can enter the code online to learn what farm, field, or ocean our ingredients are sourced from. When it comes to clam chowder, how many times did you need to play with the recipe before you got it right? What is in the marketplace is the 55th version. What raw material is the hardest to get? The single most difficult ingredient to source is natural, frozen, white, cooked chicken meat with no additives. At the factory, what would I see? A lot of specialized equipment working in sync to make these soups. When we are in production, we fill one 15-ounce pouch every second. I take cuttings, or samples of the soup, to make sure it’s on target. Why did you decide to kick the can in favor of a pouch? The pouch concept is from Asia and Europe, where packaging is technologically more advanced. What is it like to compete in such a crowded marketplace? In the retail grocery business, there’s a very painful thing known as slotting, a fee manufacturers pay to go on the shelf. We don’t have a slotting budget comparable to Campbell’s or Progresso, so we have to make a better product to justify our shelf space. This is not a business for the faint of heart. What’s for lunch today? Soup? No, salad. Honestly, we are sampling so often that I’ll eat anything but soup, please.